I did create one painting while we were on our trip. 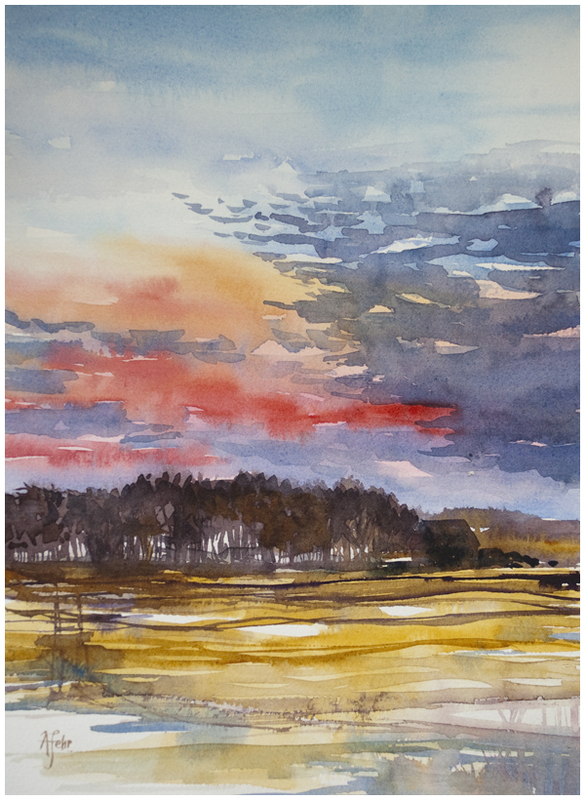 Wade and I took a ride on an ATV out in his folks' pasture and I was so tempted to get up early one morning to paint the sunrise on the marsh near their home. So beautiful and full of waterfowl! One the way back to the house, I was struck by the sky above the trees bordering the yard. Clouds so dark and the sunset at that "overripe" stage, just fading to dusk. I immediately set out to paint it as soon as we were back indoors. Sunsets are tricky to photograph, which makes them hard to paint, since there's an absence of good reference material. Painting them immediately, while the colours and contrast are still fresh, is the best way to do it. "Saskatchewan Sunset" measures 9" x 12" and is available for purchase by contacting me.